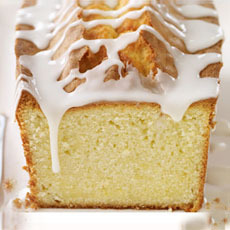 Top: Vanilla pound cake with a lemon glaze from Spice Islands. Bottom: Cut view of a similar recipe from Baked NYC. A pound cake is a loaf cake, although some people make them in Bundt pans. The original pound cake, buttery and moist, recipe was made with one pound each of butter, flour, sugar and eggs (that’s about eight eggs), plus flavoring—hence the name. Vanilla or lemon are the classic pound cake flavors, but quite a few variations have evolved through the years—adding buttermilk, cream cheese or sour cream to the batter, as well as every flavoring under the sun (amaretto, Black Forest, blood orange, cappuccino, caramel turtle, chocolate/white chocolate, chocolate chip, coconut-macadamia, Grand Marnier, Key lime, peanut butter, pecan, and so on). Others add fruit or a fruit swirl. The original recipe, developed in England in the 1700s, made a very large and dense cake. By the mid-1800s, the ingredient proportions had been adjusted to make a smaller, lighter cake. The British pound cake is actually a fruit cake containing currants, raisins, sultanas (golden raisins) and glacé cherries. Pound cakes were the traditional wedding cakes. Since the ingredients are so simple, it’s hard to make a bad pound cake—just use the freshest eggs and butter you can find, real vanilla extract, and don’t over-bake. 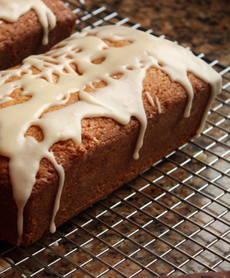 Pound cakes are so easy to make—why not whip one up to celebrate National Pound Cake Day? While a plain piece of pound cake is a joy, some added whipped cream, berries, vanilla ice cream or the full monte—a pound cake hot fudge sundae—makes the occasion even more joyous.